Aluminum Awnings - Aluminum Patio Awnings | Wrisco Industries Inc.
Stepdown Aluminum Awnings are made from Prefinished Aluminum in a variety of colors. Enjoy a wide selection of applications for covering exterior doors, windows, docks, carports and storefronts. 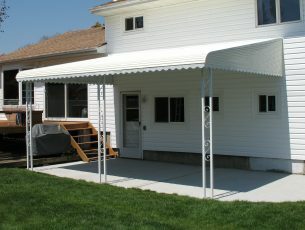 Durable all aluminum patio awnings create new shelter for your family protection, family car and business! Make an emphasis on style with a cover that keynotes your architectural scheme. Smart horizontal lines convey the contemporary mood, with a choice of decorator colors and a variety of trims! 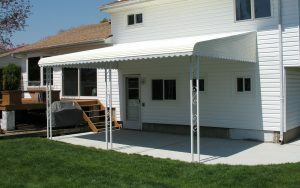 The perfect patio cover will deflect the sun, save energy, reduce air conditioning costs, provide wonderful shade, shelter weather and keep out the wind and cold. Add months to your outdoor pleasure while adding a new distinction to your home or business. A variety of styles, a kaleidoscope of colors – you coordinate your own colorful Aluminum Awnings and Aluminum Patio Awnings. They will make the most beautiful additions for your home or business, improving both appearance, value and image! While these color spot deposits reproduce actual “Decorator Colors” with reasonable accuracy, they are for color identification only.